In the Journal of Emergency Medicine, Dr. Mareiniss and colleagues and the Johns Hopkins Center for Medicine & Law at the Department of Emergency Medicine recently published an article that reviewed legal requirements of the AMA process and examined how properly executed AMA discharges can protect institutions. “In situations when AMA discharge is unavoidable, the key is to optimize legal protection,” Dr. Mareiniss says. Usually, determining capacity is relatively straightforward. However, if capacity is unclear and patients wish to leave AMA, emergency physicians should consult psychiatry whenever feasible. Prolonged observation may be necessary in some situations. In cases of intoxication, mental capacity often returns as patients become sober. If intoxication persists and hampers capacity, involuntary admission may be the only remaining course of action. “A patient’s signature on an AMA form, by itself, doesn’t indicate informed consent,” says Dr. Mareiniss. 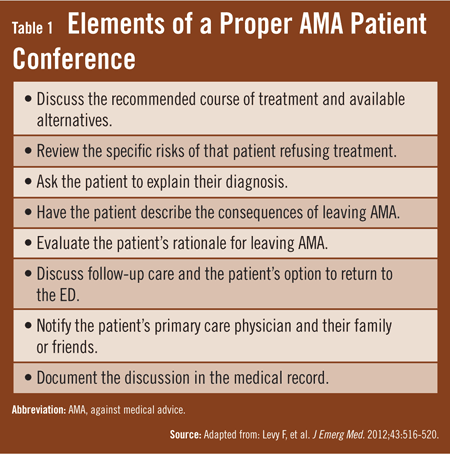 “Before executing AMA forms, it’s important to talk to patients thoroughly about the risks and consequences of leaving AMA. Patients should receive all information relevant to an AMA decision, including their medical condition, therapeutic options, and the risks and benefits of accepting or refusing treatment. Having patients confirm their understanding of this information and demonstrate reasons for deciding to leave AMA is also critical. Failure to do so may create legal liability even if patients refuse care.” The elements noted in Table 1 should be discussed in detail. If patients show that they have capacity and have been adequately informed of their risks but still insist on leaving AMA, emergency physicians should document the discharge. Table 2 lists some key elements of a comprehensive AMA form. Proper documentation can be done in patient charts and should include information on decision-making capacity, the risks that were disclosed, decisions made by patients, and both patients’ and providers’ signatures. Emergency physicians should assess the AMA form for adequacy and write in any items that may be missing. 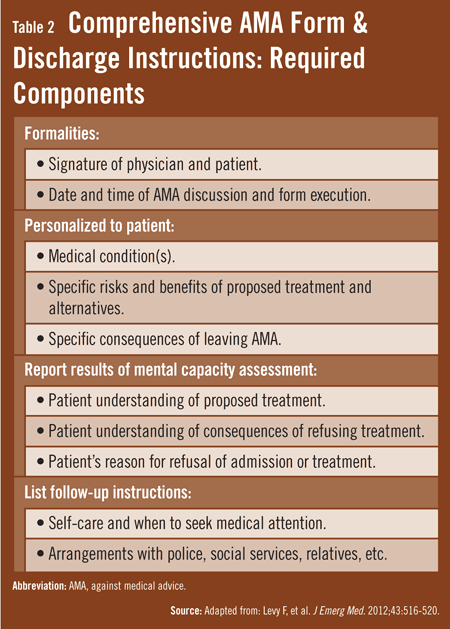 If patients refuse to sign the AMA form, physicians should read it aloud, document the refusal to sign, and note that the patient was made aware of the risks of leaving AMA. AMA forms are not a legal panacea and will not always provide total immunity from lawsuits. These forms and procedures do not completely insulate emergency physicians from liability in a medical malpractice action. However, properly executed AMA forms and procedures can provide physicians and EDs important legal protections. There are three ways that properly executed AMA forms can provide protection, according to Dr. Mareiniss. First, some courts have found that a proper AMA discharge terminates the physician–patient relationship. With that, signing out AMA terminates legal duties of physicians to treat a patient and avoids any claim of liability. However, this protection is dependent on the governing law of the state. Second, AMA forms may entitle providers to an additional defense of assumption of risk. This affirmative defense can excuse liability in certain state jurisdictions where patients are found to have assumed undue risk. Third, the AMA records evidence of refusal of care. These forms are not required, but having them can help refute allegations of negligent or improper discharges. Levy F, Mareiniss DP, Iacovelli C. The importance of a proper against-medical-advice (AMA) discharge: how signing out AMA may create significant liability protection for providers. J Emerg Med. 2012;43:516-520. Available at: http://www.jem-journal.com/article/S0736-4679(11)00540-3/abstract or at http://www.medscape.com/viewarticle/770719_print. Hwang SW. Case and commentary: discharge against medical advice. Agency for Healthcare Research and Quality. May 2005. Available at: http://www.webmm.ahrq.gov/case.aspx?caseID=96. Magauran BG Jr. Risk management for the emergency physician: competency and decision-making capacity, informed consent, and refusal of care against medical advice. Emerg Med Clin North Am. 2009;27:605-614. Ding R, Jung J, Kirsch TD, Levy F, McCarthy ML. Uncompleted emergency department care: patients who leave against medical advice. Acad Emerg Med. 2007;14:870-876. Pennycook AG, McNaughton G, Hogg F. Irregular discharge against medical advice from the accident and emergency department: a cause for concern. Arch Emerg Med. 1992;9:230-238. Jerrard DA, Chasm R. Patients leaving against medical advice from the emergency department: how many of them actually return to continue their evaluation and what are the reasons the others do not? Ann Emerg Med. 2004;44:S130-S131. Henson VL, Vikery DS. Patient self discharge from the emergency department: who is at risk? Emerg Med J. 2005;22:499-501. Darren P. Mareiniss, MD, JD, has indicated to Physician’s Weekly that he has or has had no financial interests to report.